Auxiliary - USCG information on Auxiliary boating safety classes and courtesy boat examinations and boating safety. An Unofficial CG Blog - Commentary, opinion, and news about the nation's smallest military service, the USCG, a multi-mission, maritime, armed force. CGA Chase Hall - First black Coast Guard cadets in Chase Hall. Coast Guard Compass - Official blog of the USCG. Hell of A Day at Sea - First hand information from those that are serving. My Coast Guard Career - Experiences of a small town Midwestern girl who left home to join the United States Coast Guard. The Coast Guard Report - "Transparency breeds self-correcting behavior." Boating Safety Circulars (BSC) - The USCG BSC is a means to "pass the word" on various rules and regulations for recreational boats and other items of general boating interest. CG-612 Directives and Publications Division - Provides all unclassified and non-for-official-use-only (non-FOUO) Coast Guard instructions, manuals, and notices, provided in real-time. Coast Guard Academy (New London, CT) - Offers an integrated life experience which emphasizes academics, physical fitness, character and leadership, in order to graduate officers of the highest caliber. Coast Guard Auxiliary - With nearly 27,000 members, the U.S. Coast Guard Auxiliary provides safety patrols on area waterways and regularly meets with the boating public at marinas and in classrooms. It also directly assists the U.S. Coast Guard in non-law enforcement programs such as search and rescue, and marine environmental protection. Coast Guard Aviation Association - Home of The Ancient Order of the Pterodactyl. Coast Guard Combat Veterans Association - Home of the Coast Guard combat veterans. Coast Guard History - Information on the U.S. Coast Guard, its missions, history and people. E.g., search and rescue, drugs, law enforcement, migrants, interdiction, oilspill, marine safety, marine environment, military, U.S. waters, exclusive economic zone, ice breaking, arctic, antarctic fishing, vessel services, boating safety, recruiting. Coast Guard Home Page (Headquarters) - U.S. Coast Guard (USCG) starting page. The USCG is a military, multi-mission, maritime service. The Coast Guard's five operating goals are Safety, Protection of Natural Resources, Mobility, Maritime Security and National Defense. Coast Guard Channel - News and entertainment network dedicated to delivering high-quality video programming about the U.S. Coast Guard. Coast Guard Gallery - Video, audio, photographs, other multimedia news and information, and CG art. Coast Guard News - This site is not affiliated with the U.S. Coast Guard or the Department of Homeland Security, but material here is drawn primarily from official press releases filed by US Coast Guard Public Affairs offices throughout the country. On Scene - CG search and rescue magazine. Media Port: Coast Guard Headquarters - Coast Guard news, information, photos and videos of Coast Guard cases, events and operations. Media Port: Eleventh Coast Guard District Public Information (USCG - Northern California) - U. S. Coast Guard Sector San Francisco. SPO, Direct-Access, and Pay & Personnel News Feed and News Updates - Notices and information on Coast Guard military pay and personnel policy and procedures. Unofficial Coast Guard Blog - Commentary, opinion, and news about the nation's smallest military service, the USCG, a multi-mission, maritime, armed force. Coast Guard Pay and Personnel Center (PPC) - Information on military pay, services, separation, travel expenses, etc. Also see PPC Retiree & Annuitant Services Branch for information on retirement processing. Coast Guard Recruiting - Learn about opportunities to learn, serve and grow in the U.S. Coast Guard. Coast Guard Reserve - Provides trained personnel for active duty in time of war or national emergency and at such other times as the national security requires. Coast Guard Store - Coast Guard merchandise on Amazon.com. 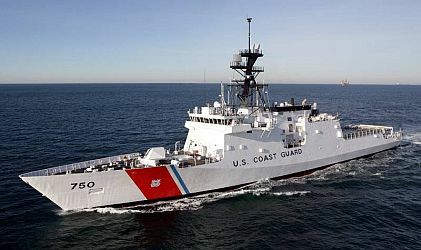 Coast Guard Units and Locations - Maintenance and logistics command, districts, state by state unit listing, headquarters units, CG HQ organization. Deck Exams - STCW requirements for deck officers' licenses. Department of Homeland Security (DHS) - Homeland Security leverages resources within federal, state, and local governments, coordinating the transition of multiple agencies and programs into a single, integrated agency focused on protecting the American people and their homeland. More than 87,000 different governmental jurisdictions at the federal, state, and local level have homeland security responsibilities. USCG is a department within DHS. Directives - Commandant instructions, notices and manuals. Cancelled directives, new directives, directives publications and reports index. FOIA Home Page - USCG FOIA information. Foundation for Coast Guard History - Preserving the history of the U.S. Coast Guard. Legal - The Coast Guard legal program delivers high-quality legal advice and support to the people who carry out the varied functions of the Coast Guard to ensure their missions, operations and activities can be achieved within the spirit, as well as the letter, of the law. Lifesaving and Fire Safety - USCG lifesaving and fire safety standards for commercial ships and recreational boats. Local Notices to Mariners (LNM) - USCG's primary means for disseminating information concerning aids to navigation, hazards to navigation, and other items of marine information of interest to mariners on the waters of the U.S., it's territories, and possessions. These notices are essential to all navigators for the purpose of keeping their charts, Light Lists, Coast Pilots and other nautical publications up-to-date. Published weekly. Also see LNM Archives. Marine Safety and Environmental Protection Resources Available on the Web - USCG documents and other information of general interest to the maritime community: Navigation Rules, Regulatory Links, Standards of Training, Certification and Watchkeeping for Seafarers (STCW), Waterways Management, Vessel Documentation Center, Marine Safety Center. Marine Safety and Environmental Protection Program Regulations Page - Information regarding proposed and final Federal regulations affecting commercial vessel safety, port safety and security, and marine safety and environmental protection. Media (Gallery) - Includes Coast Guard Magazine, Graphics, Photography, Video, Audio, Pentagon Channel Coast Guard Video News, Coast Guard Art, and special features. Military Associations - Listing of military associations. National Maritime Center - Providing credentials to mariners. National Vessel Documentation Center - USCG instructions, forms, procedures. Navigation and Inspection Circulars (NVICs) - A Navigation and Vessel Inspection Circular (NVIC) provides detailed guidance about the enforcement or compliance with a certain Federal marine safety regulations and Coast Guard marine safety programs. While NVIC's are non-directive, meaning that they do not have the force of law, they are important "tools" for complying with the law. Non-compliance with a NVIC is not a violation of the law in and of itself, however non-compliance with a NVIC may be an indication that there is non-compliance with a law, a regulation or a policy. Navigation Center (NAVCEN) - USCG navigation services including GPS/DGPS, Loran, Local Notices to Mariners, recreational boating safety information, marine communications information. Navigation Rules (aka Rules of the Road or Nav Rules) - International and Inland Navigation Rules presented by the USCG. Those seeking official versions of the Navigation Rules should refer to the International Navigational Rules Act of 1977 (Public Law 95-75, 91 Stat. 308, or 33 U.S.C. 1601-1608), and, the Inland Navigation Rules Act of 1980 (Public Law 96-591, 94 Stat. 3415, 33 U.S.C. 2001-2038). Also see RulesMaster Pro, a learning guide to the International Regulations for Preventing Collisions at Sea (COLREGS), the US Navigation Rules (NavRules), the Canadian modifications to the Rules and IALA buoyage. Office of Boating Safety - USCG office devoted to boating and boater safety including including boating classes, safety, recalls, federal regulations, links to other boating sites. Office of Investigations and Analysis: Marine Casualty and Reporting Forms - Reporting forms, including CG 2692 Report of Vessel Casualty, Instructions for CG 2692, Report of Vessel Casualty, CG2692A Barge Addendum, CG2692B Report of Required Drug and Alcohol Testing Following a Serious Marine Incident, and CG-5573 USCG Drug and Alcohol Testing Data MIS Data Collection form. Office of Law Enforcement - This USCG office oversees enforcement of U.S. laws and treaties in three areas: Drug Interdiction, Living Marine Resources, and Alien Migrant Interdiction. Polar Sea - The world's most powerful non-nuclear icebreaker. Port State Control (PSC) - Vessel detention lists, flag lists, class lists, owners and operators list, Port State Information eXchange (PSIX) System Database, International Safety Management Code (ISM), PSC publications. Prevention Department - esponsible for the planning and administration of Auxiliary programs to support and augment the USCG's Prevention Directorate. As such, we assist and augment the Coast Guard's role ensuring safety and environmental protection of waterway resources. Search and Rescue (SAR) - Coast Guard SAR response involves multi-mission stations, cutters, aircraft and boats linked by communications networks. Also see SAR's On Scene magazine. Standards for Training, Certification, and Watchkeeping (STCW) - Created in 1978 and amended in 1995 in order to ensure that US Merchant Mariners have the skills & abilities to serve aboard seagoing vessels. International Maritime Organization (IMO) is the owner of the STCW. The US Coast Guard implements its polices through legal means established in 1978 and amended in 1995. Vessel Documentation - Access the USCG vessel data base and extract vessel characteristic, documentation, and ownership data. This data base is updated on a monthly basis. The query program retrieves data about vessels that are 5 net tons or larger and are documented by the USCG. Craft less than 5 net tons ("boats") are numbered by individual states. Refer to data caveats page for information about who collects vessel documentation data, the type of data collected and for the authorization and rationale for publishing these data. Vessel Documentation Query by Vessel Name - You can access NOAA's copy of the United States Coast Guard's (USCG) vessel data base and extract vessel characteristic, documentation, and ownership data. Vessel Response Plan (VRP) - Vessel Response Plan (VRP)/Shipboard Oil Pollution Emergency Plan (SOPEP) home page. Vessel Traffic Service (VTS) Los Angeles-Long Beach - Jointly operated by the Coast Guard and Marine Exchange of LA/LB from the Vessel Traffic Center located in San Pedro. The VTS assists in the safe navigation of vessels approaching the ports of LA/LB in an area extending 25 miles out to sea from Point Fermin. Vessel Traffic Service (VTS) San Francisco - Monitors vessel movements, informs mariners of other vessels and potential hazards, recommends courses of action when we see a situation that the mariner may not have seen, and directs the outcome of situations when necessary to prevent disasters. This webpage last updated on Monday, January 16, 2017 11:15 AM.